St Matthew Lutheran School is a Christian based school. Throughout the school year, the children will learn about God and Jesus through stories, music, thematic units, direct instruction, and play activities. Teaching is based on Christian joy, love, and understanding. The children will gain independence, self-confidence, responsibility, and concern for one another while developing pre-academic and kindergarten readiness skills in our preschool program so the transition to a more rigorous kindergarten classroom environment is seamless. Our goal is to make the transition between home and school a happy, exciting experience. At St Matthew, we are happy to offer our families flexible scheduling. 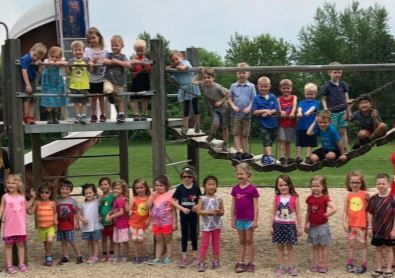 You may choose to sign your child up for a traditional preschool program which runs for 2.5 hours (8:30-11:00am) or 6 hours (full day, 8:30am-2:30pm) Mondays - Fridays for 3 and 4- year olds. Our flexible scheduling also offers families the ability to drop their child off at school beginning at 7:00am (please see the Extended Care details). In addition, students registered for preschool morning classes may have the option of staying for lunch bunch which runs from 11:00am-Noon. No advance notice is required to participate in the lunch bunch program on any given day. You simply let your child's teacher know when you are dropping them off that morning that they will be staying for lunch bunch that day. Morning students also have the option of staying for the afternoon enrichment program on an as needed basis. You do not need to pre-register or provide any advance notice to add on an afternoon. Simply let your child's teacher know when you drop them off in the morning that they will be staying for the afternoon class as well. If you are unable to pick them up at 2:30pm when the afternoon class ends, they will be brought to our extended care program where they are able to stay until 6:00pm. Lunch Bunch, before and after care, and class add ons are billed separately...statements are sent home at the end of each month. Children will work on letter recognition and printing letters, developing one-to-one correspondence, counting, and number recognition. The program provides a balance between child-directed play and teacher directed learning activities. Above all, children are taught about Jesus' love and forgiveness. For our parents who need to drop their child off before preschool begins (7:00am-8:30am) would need to schedule with the school office prior to the days in need. The morning fee is $6.00. Our extended care program that runs in the afternoons is $6 per hour. Registration for this program is required, and scheduled with the school office. Let your child enjoy an extra hour with their friends and have them stay for lunch bunch. There is no advance registration required. Simply let your childs teacher know when you drop them off in the morning that they will be staying for lunch bunch. If you haven't pre-ordered a hot lunch for your child, be sure to send a lunch along with them. The fee for lunch bunch is $5 per day. Lunch Bunch is billed separately...statements are sent home at the end of each month. Even if your child is not signed up for our full day program, you may choose to add on an afternoon class on an as needed basis. When you drop your child off in the morning, simply let your childs teacher know that they will be staying for lunch bunch and the afternoon class. The fee to add on an afternoon class is $25 per day. If your child attends either our morning program and you would like to add on an additional morning class on an as needed basis, you will need to contact your childs teacher in advance to receive approval for a morning class add on. If approved, the fee for a morning class add on is $25 per day.